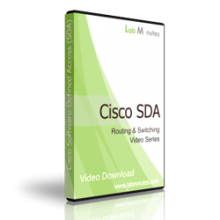 This video bundle features a complete video download set for Cisco Software Defined Access (SDA). With almost 20 hours of lab video tutorial, you will be able to get up to speed and become more familiar with the technologies. Buy this video bundle and view them locally ad-free on your computer at your own pace without internet connection, and get a saving over 15%. This video bundle gives you a head start on Cisco latest access technology of SDA. The video series begins by providing you with the fundamental of Cisco SDA before walking you through the DNAC installation, solution setup, and configuration of major SDA features. The key topics covered in this video series include network device management, configuration automation, SDA wired and wireless fabric, and DNA assurance (see full list below). Do not miss out an opportunity to learn and be prepared for the next generation campus network.